Notre-Dame Basilica: Montreal's Most Popular Attraction? Quebec has some pretty stunning churches, and anyone who's seen Montreal's Notre-Dame Basilica knows it makes the short list. The top of the short list. Scroll further below for information on visiting the basilica. Declared a minor basilica by Pope John Paul II in 1982, the Notre-Dame Basilica was originally Notre-Dame Church, a smaller, humbler place of worship that was first dedicated in 1682, this after a decade of building efforts culminated in its eventual consecration under the care of the Catholic Church's Sulpician Order, the group that founded Ville-Marie, the city of Montreal's first and by extension oldest borough. But by 1824, it was obvious the original church was no longer big enough to accommodate the congregation's blossoming numbers and so construction began on what's today's familiar twin tower Gothic revival exterior, a design created by James O'Donnell, a Protestant Irish American. The church portion itself was opened in 1830 and the Basilica's two signature towers were fully erected by 1843. At the time, it was the largest church in North America. The interior was a different story, one that naturally began once the exterior was more or less complete. The artistry and intricate detailing associated with the Basilica would take well over a generation to realize. Tweaks and additions have since been part and parcel of the structure's evolution, notably the addition of one of the Basilica's most striking features, a small chapel consecrated by year's end in 1891, the Chapel of Notre-Dame du Sacré-Cœur. Notre-Dame Basilica is one of Montreal's most popular attractions, an imposing architectural sight with the kind of interior you'd expect to stumble on in the heart of Paris. But in this case, you're blocks away from the water's edge of a New World port, in a cobblestone neighborhood straight of an Old World picture book. 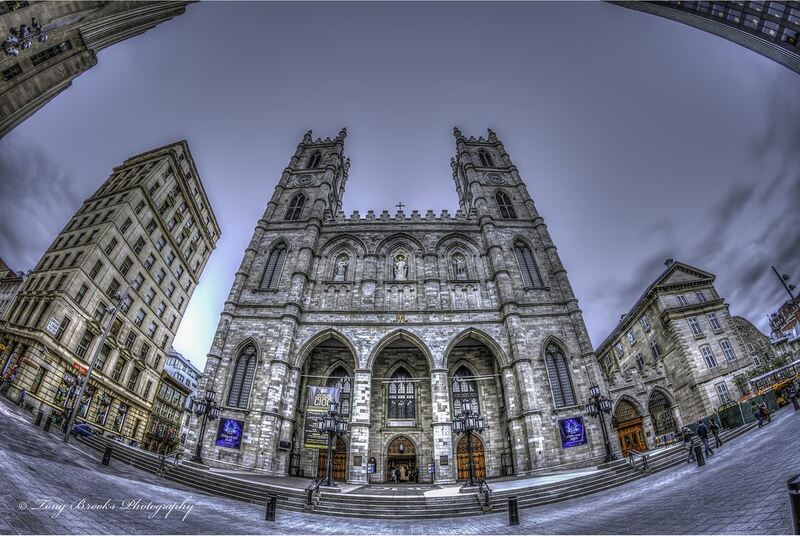 The Notre-Dame Basilica is a short walk from the closest subway station, Metro Place d'Armes. How Long Does It Take to Tour Notre-Dame Basilica? It depends on if you plan on attending Mass or not. Touring the entire building and chapel could take anywhere from 30 minutes to 90 minutes. A 20-minute tour guided tour is offered to visitors on the hour and half-hour on weekdays from 9 a.m. to 4 p.m., Saturdays from 9 a.m. to 3:30 p.m. and Sundays from 1 p.m. to 3:30 p.m. Note that this schedule is subject to change without notice to accommodate funerals, weddings and other activities at the Basilica. Mass is held every day, Monday through Friday at 7:30 a.m. and 12:15 p.m., Saturdays at 5 p.m. and Sundays at 8 a.m., 9:30 a.m. 11 a.m., and 5 p.m. Sunday 11 a.m. masses feature live organ music and the basilica choir. Note that services are conducted in French and schedules are subject to change without notice. Check here for the Notre-Dame Basilica's detailed Mass schedule. 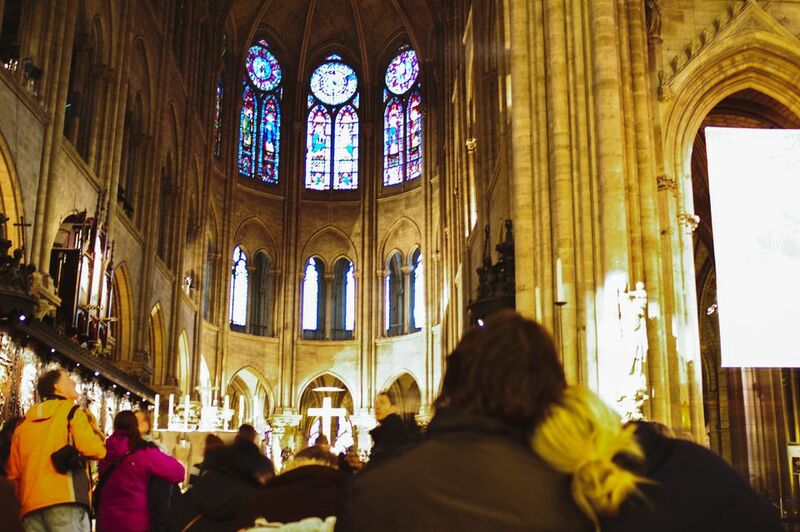 When Is the Notre-Dame Basilica Open? The Basilica is open for prayer as of 7:30 a.m. every day and the Church is open to visitors Monday to Friday from 8 a.m. to 4:30 p.m, Saturday from 8 a.m. to 4 p.m. and Sunday from 12:30 p.m. to 4 p.m. Note that this schedule is subject to change without notice to accommodate funerals, weddings and other activities at the Basilica. Modest entrance admission fees are required to afford the regular upkeep the Basilica needs to remain in pristine condition. Regular admission $5, ages 7 to 17 $4, free for ages 6 and under. A twenty-minute guided tour is included with admission. Admission to the Basilica remains free for prayer, Mass (except Christmas and Easter Mass where a small admission fee is usually imposed), Confession, meditation and to take part in the liturgy of the hours. Regular metered parking is available on surrounding streets. Beware Old Montreal tourist traps. The neighborhood is teeming with them. However, the following recommendations are trap-free, all vetted by yours truly (for those new to my work, I adhere to a strict ethics policy complete with full disclosure requirements. My interest lies in you trusting my judgment, not my making a bribed buck at your expense). Roughly one block away from the Notre-Dame Basilica is Kyo, a Japanese izakaya of which I'm rather fond. A longer walk east will bring you to Le Bremner or go west and sup at Barroco, two top fine dining bets that represent some of the best Montreal has to offer. The first is casual and seafood-oriented, the second, elegant and upscale featuring Franco-Spanish fare. For tighter budgets looking for a quick daytime eat, a short, 5- to 10-minute walk away from the Basilica are Harmonie Bakery and Johnny Chin's dragon beard candy stand, two of my favorite Montreal Chinatown haunts. Note that neither have any seating arrangements. You just order up and go. This profile is for information purposes only. Any opinions expressed in this profile are independent, i.e., free of public relations and promotional bias, and serve to direct readers as honestly and as helpfully as possible. TripSavvy experts are subject to a strict ethics and full disclosure policy, a cornerstone of the network's credibility. Ever Been to an Urban Archaeological Dig?